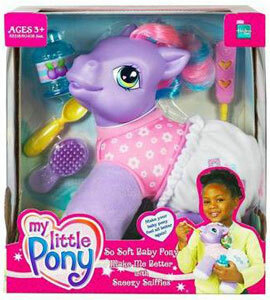 Description Of Item: SNEEZY SNIFFLES is the sweetest pony ever ? a special baby pony who needs you to love and care for her. When she's not feeling well, use the thermometer to take her "temperature" and give her pretend medicine from her bottle. With your special care, she?ll feel better in no time! Pony figure comes with spoon, medicine bottle, thermometer and brush.